DiscoMcPlays – Copyright Terms – DiscoMcPlays! This page is mainly for me to use when referencing any future copyright or monetisation claims. It’ll probably get updated with additional resources etc over time. Note: This is probably a good plan and format for all people attempting to create content in the new YouTube ContentID pro-active era. I highly recommend everyone attempt to create something like this if they plan on monetizing their videos and content. The following is the formal and complete information for Copyright cover on the audio and footage for my videos on YouTube. Note: Some of these confirmation and official approvals are formed of conversations. Where possible all written confirmations have also been “Screenshotted” and provided alongside the transcribed text. You might remember me, hopefully you do. I’m the guy who has been using your Disco Daze track for my LP series..
Well, I’m sure you’ve heard all the ridiculousness about content ID claims etc going on at YouTube. 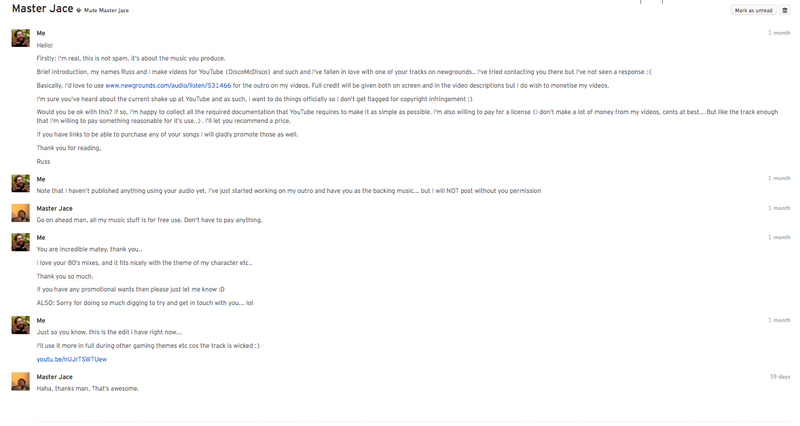 Well… My videos look set to be flagged every upload. Thing is, I don’t make a lot of money from these videos… cents at a time, but am happy in this case to purchase a licence from you for use of this track in my videos. I’m not sure if this is the best way to get in contact with you, but I’ve also tried on Newgrounds. I hope you consider this and let me know as soon as you can, i love the track and so do the viewers. Hey dude, Sorry for the delayed response. 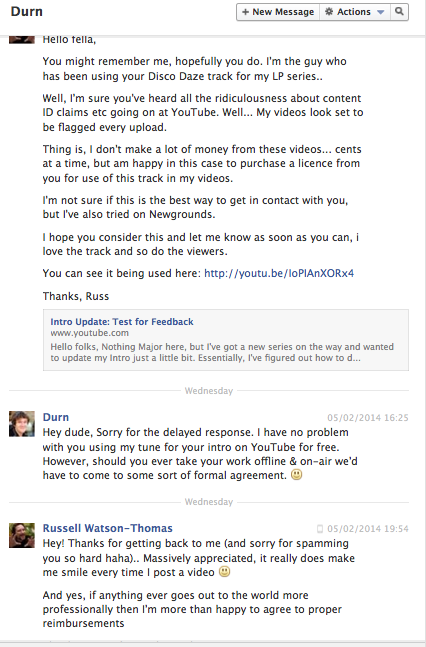 I have no problem with you using my tune for your intro on YouTube for free. However, should you ever take your work offline & on-air we’d have to come to some sort of formal agreement. Firstly: I’m real, this is not spam, it’s about the music you produce. Basically, I’d love to use http://www.newgrounds.com/audio/listen/531466 for the outro on my videos. Full credit will be given both on screen and in the video descriptions but I do wish to monetise my videos. Would you be ok with this? If so, I’m happy to collect all the required documentation that YouTube requires to make it as simple as possible. I’m also willing to pay for a license (I don’t make a lot of money from my videos, cents at best… But like the track enough that I’m willing to pay something reasonable for it’s use..). I’ll let you recommend a price. If you have links to be able to purchase any of your songs I will gladly promote those as well. Go on ahead man, all my music stuff is for free use. Don’t have to pay anything. You are incredible matey, thank you.. 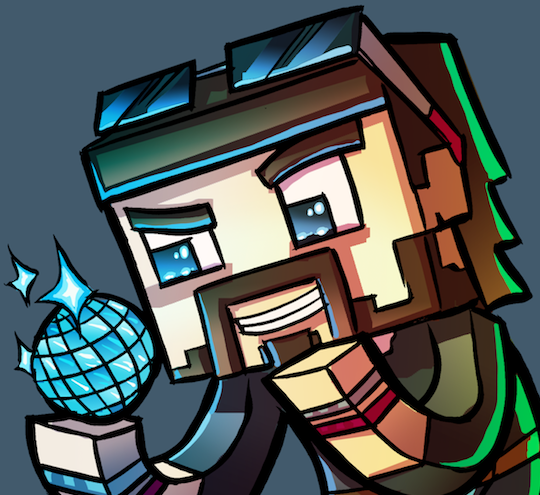 I love your 80’s mixes, and it fits nicely with the theme of my character etc..
Mojang provide an end user license agreement that states, clearly, that the ability to use its assets is prohibited however the games and it’s content, audio etc are free to use in Let’s Plays, Reviews etc. “You are allowed to put footage of our Game on YouTube or any other website. In fact, we like you doing so. You may make money using your videos of our Game so, for instance by putting ads on them, as long as you also add your own unique content to the video, such as audio commentary. The amount you add must also be enough to make it fair and worthwhile for someone to pay for it or for you to make money from it. For example you couldn‘t just include your logo, web address or indent but you could add an audio commentary or your own music if you are creating a music video. All audio commentary is provided by me, or in collaboration with other content providers (i.e. my friends, people I’ve met in game etc). All persons are informed of my intention to record, and agree ahead of any recordings for me to record and distribute that audio alongside my videos. In the majority of cases, I’m working with people creating similar content and as such we have a mutual understanding that we can both use each others audio content. Where possible, I like to include fitting audio from Artists I find on the Newgrounds website. All audio here is provided under the Creative Commons: Attribution license. Any artist I wish to use is contacted and informed of my intentions to publish video including their audio and that they will be linked to directly to drive traffic and provide attribution information. In all cases this has been agreed by the artist and I have never been refused. All artists are offered the opportunity to provide me links to content that means that they can make money through me for the use of their audio. This will ALWAYS be provided in the video description when requested. I’m all about promoting great talent, and appreciate their acceptance of using their audio. Any additional sound effects, clips etc are sourced from either me (production) or via free to use, royalty free service websites. Where applicable, details for these can be obtained if they are ever in question. All Graphics, text and animations are produced by myself or for myself by fans or paid for by myself on a commission basis. Note that any and all logos, titles, game graphics etc used are from officially promoted and sourced Press Packs, and meet with the Fair Usage policy guidelines for the branding of any third party. This includes, but is not limited to Facebook, Twitter, Reddit, Mojang, Minecraft, Newgrounds, Soundcloud, YouTube, Google, Steam and WordPress. Note that additional titles are added per series, however each of these follow the same guidelines included herein. I have NO PROBLEM with this whatsoever. I would ask that you keep things to a minimum, don’t just re-post my videos, but if you want to create introductions, animations, audio clips, remixes etc then feel free to do so, and don’t forget to send me the link via all of the many social medias so I can share it around for you!